Don’t Run Out Of the House Without Grabbing One..or Two..of These On Your Way Out The Door. I am on the hunt for the perfect muffin! I don’t know why but I just can’t make up my mind on which recipe is better. I guess I will have to make them again so I can test them out. wink ..wink. I am not sure when or where I acquired my little muffin pans. I have two of them and I love being able to mix up a batch of muffins, knowing that I can make a few different sizes. To be honest, I love the little size muffins. They kind of remind me of donut holes! Plus, then the kids were younger it was a perfect sized treat, just right to hole in their little cherub fists. The last thing I want is a huge muffin the size of an orange being consumed by a toddler! Talk about mess! Now with grands, I can’t wait to make muffins again with those little pans. Perfect size for tea-parties! But the best part of this recipe is that you can use frozen or fresh blueberries. So basically these should be on you baking list all year around! This is what Amy at Belly Full has to say about this yummy breakfast muffin! 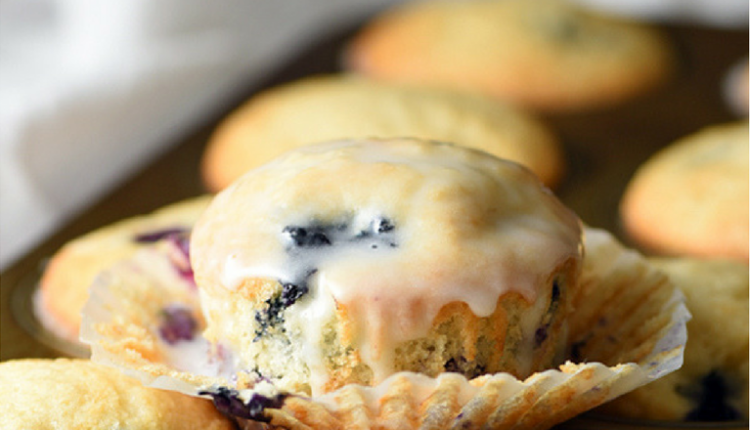 These Quick and Easy One-Bowl Blueberry Muffins are light, fluffy, and loaded with blueberries. With only one bowl clean up is a breeze. Perfect for breakfast on the go! Quick Tip: If you are using frozen blueberries, do not thaw first, just use them frozen. Dust berries with flour to prevent them sinking to bottom while baking. In a Rut? Here is a quick and Easy Way to Get Back On the Road Toward Dinner Success!